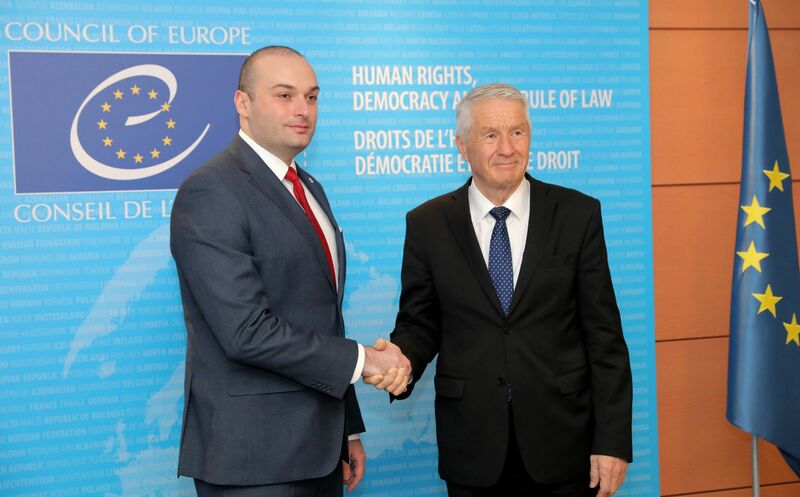 The common interests of Georgia and the Council of Europe, along with the country's ongoing complex reforms, were discussed during today's meeting in Strasbourg between Georgian Prime Minister Mamuka Bakhtadze and Secretary General Thorbjørn Jagland of the Council of Europe. As it was pointed out, 2019 marks the 70th anniversary of the Council of Europe and also the 20th anniversary of Georgia's accession to the organization. Special emphasis was placed on the concrete results of intensive cooperation and challenges facing the Council of Europe. The Prime Minister thanked the Secretary General of the Council of Europe for preparing consolidated reports on the conflicts in Georgia's territories, and for the decisions adopted by the Committee of Ministers' Deputies, also for the development of the Council of Europe Action Plan for Georgia. "I am very pleased to be here in the Council of Europe, and to have this opportunity to talk to the Secretary General. I thanked Mister Jagland personally for his contribution to the fruitful cooperation that we have with the Council of Europe. And I am even more delighted to be here on this very significant occasion of commemorating 20 years of Georgia's accession to the Council of Europe. At the same time, 2019 marks the 70th anniversary of the Council of Europe. Therefore, it is an excellent opportunity to discuss the issues of common interest for Georgia and the Council of Europe. During our meeting we have outlined the importance of ambitious and complex reforms carried out by the Government of Georgia over the past years. We also discussed the coming Georgian presidency of the Committee of Ministers which is an important event for my country. We also discussed the present challenges within the Council of Europe and the necessity of unanimous action. Special attention was paid to further deteriorated security, human rights and humanitarian situation in the occupied regions of Georgia. Deprivation of life of Georgian citizens has become a dangerous trend in the occupied regions, which underlines the necessity of establishment of international security arrangements on the ground. I thanked the Secretary General for the Consolidated Report on the Conflict in Georgia and the decisions adopted by the Committee of Ministers' Deputies, as well as Council of Europe Action Plan for Georgia. We look forward to continue close and fruitful cooperation with the Council of Europe in the future," Mamuka Bakhtadze said. 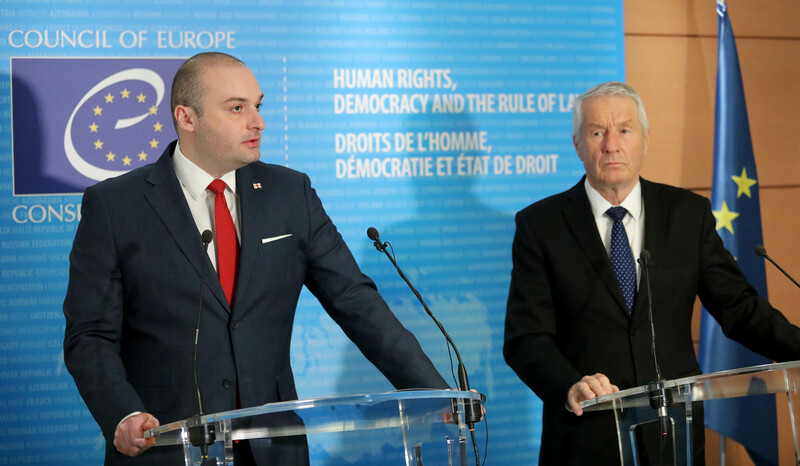 The high level of Georgia-Council of Europe relations, and the important work carried out under the Council of Europe Action Plan, was emphasized by Secretary General Thorbjørn Jagland of the Council of Europe. "An important result, for instance, is the revised Constitution, which brought Georgia to parliamentary democracy. There was certain turbulence during the presidential election, but making a better political climate is not for us to decide. I would also like to say that as long as have been here, for ten years, we have twice a year issued consolidated reports about the situation in the breakaway regions of Abkhazia and South Ossetia. I think it is important to continue this reporting. I discussed with the Prime Minister how we can further improve access to these areas. We will also continue with confidence-building mission which, I understand, is appreciated by the Georgian Government. All in all, for us, Georgia represents a good of example of how we can cooperate and how we can all benefit from exchange. I think it will continue, and we are looking forward to it," Thorbjørn Jagland emphasized. At the conclusion of the meeting, the Prime Minister of Georgia acknowledged his visit in the Council of Europe Guestbook.